ທ່ານ​ນາງ ເທ​ຣີ​ຊາ ເມ, ນາ​ຍົກ​ລັດ​ຖະ​ມົນ​ຕີ​ອັງ​ກິດ​ປະ​ເຊີນ​ກັບ​ການ​ລົງ​ມະ​ຕິ​ບໍ່ໄວ້​ວາງ​ໃຈ​ລັດ​ຖະ​ບານ ​ໃນ​ວັນ​ພຸດມື້ນີ້ ພາຍ​ຫລັງ​ທີ່​ທ່ານ​ນາງປະ​ສົບ​ກັບ​ການ​ເສຍ​ໄຊ​ຢ່າງ​ເປັນ​ປະ​ຫວັດ​ການ ຢູ່​ໃນ​ສະ​ພາ​ໃນ​ວັນ​ອັງ​ຄານວານນີ້ ເມື່ອ​ສະ​ມາ​ຊິກ​ສະ​ພາ​ ໄດ້​ພາກັນ​ປະ​ຕິ​ເສດຢ່າງໃຫຍ່ ຕໍ່​ຂໍ້​ຕົກ​ລົງ​ທີ່​ທ່ານ​ນາງ​ໄດ້​ເຊັນ​ກັບ​ ບ​ຣັ​ສ​ເຊີ​ລສ໌ ກ່ຽວ​ກັບ​ການ​ຖອນ​ໂຕອອກ​ຈາກ​ສະ​ຫະ​ພາບ​ຢູ​ໂຣບ​ໃນ​ເວ​ລາ​ຫລັງໆ ຂອງ​ປີນີ້. ຫລາຍ​ຄົນ​ຢູ່​ໃນ​ພັກ​ຂອງ​ທ່ານ​ນາງ ໄດ້​ລົງ​ຄະ​ແນນ​ຄັດ​ຄ້ານ​ຕໍ່ຂໍ້​ຕົກ​ລົງ​ດັ່ງ​ກ່າວ ແຕ່​ວ່ານາ​ຍົກ​ລັດ​ຖະ​ມົນ​ຕີ​ເມ ສັນ​ຍາ​ວ່າ​ຈະ​ເດີນ​ໜ້າຕໍ່​ໄປ. ດັ່ງ​ທີ່ ເຮັນ​ຣີ ຣີດ​ແວ​ລ (Henry Ridgwell) ນັກ​ຂ່າວ​ວີ​ໂອ​ເອ​ ລາຍ​ງານ​ມາ ຢູ​ໂຣບ​ໄດ້​ເຕືອນ​ວ່າ ຄວາມ​ສ່ຽງ​ທີ່ອັງ​ກິດ​ອາດ​ຈະ​ຖອນ​ຕົວ​ອອກ​ຈາກ​ອີ​ຢູ​ໄປໂດຍບໍ່​ມີ​ຂໍ້​ຕົກ​ລົງ​ໃດໆ​ໝົດ ມີ​ທ່າ​ອ່ຽງ​ສູງ​ຂຶ້ນ. ບົວ​ສະ​ຫວັນ​ຈະ​ນຳ​ລາຍ​ລະ​ອຽດ​ກ່ຽວ​ກັບ​ເລື້ອງນີ້ ມາ​ສະ​ເໜີ​ທ່ານ ໃນ​ອັນ​ດັບ​ຕໍ່​ໄປ. "ສຽງ​ເຫັນ​ດີ​ແມ່ນ​ຢູ່​ເບື້ອງ​ຂວາ ມີ​: 202 ສຽງ. ສຽງ​ຄັດ​ຄ້ານຢູ່​ຂ້າງ​ຊ້າຍ​ມີ: 432 ສຽງ." ​ໃນການໄດ້​ຮັບ​ສຽງສະ​ໜັບ​ສະ​ໜຸນ 230 ສຽງ ເປັນການ​ປະ​ລາ​ໄຊທີ່​ໃຫຍ່​ທີ່​ສຸດ ຂອງຝ່າຍ​ລັດ​ຖະ​ບານຢູ່​ໃນ​ປະ​ຫວັດ​ສາດ​ຂອງ​ອັງ​ກິດ​ໃນ​ຊຸມ​ປີ​ມໍ່ໆ​ມານີ້ ຕາມ​ປົກ​ກະ​ຕິ​ແລ້ວ ສະ​ພາບ​ເຊັ່ນ​ນັ້ນ ມັກ​ຈະ​ບັງ​ຄັບ​ໃຫ້​ນາ​ຍົກ​ລັດ​ຖະ​ມົນ​ຕີ​ລາ​ອອກ ແຕ່​ວ່າ ທ່ານ​ນາງ​ໃຫ້​ສັນ​ຍາ​ວ່າ ຈະ​ເດີນ​ໜ້າ​ຕໍ່​ໄປ. "ລັດ​ຖະ​ບານ ໄດ້​ຍິນ​ສິ່ງ​ທີ່​ສະ​ພາ​ຕ່ຳ​ໄດ້​ກ່າວ​ໄປ​ໃນ​ຄ່ຳ​ຄືນນີ້ ແຕ່​ຂ້າ​ພະ​ເຈົ້າ ຂໍ​ໃຫ້​ສະ​ມາ​ຊິກ​ສະ​ພາ​ຈາກ​ທຸກ​ຝ່າຍ​ຟັງ​ຫາງ​ສຽງ​ຂອງ​ປະ​ຊາ​ຊົນ​ອັງ​ກິດ ທີ່​ຢາກ​ໃຫ້​ບັນ​ຫານີ້​ຖືກ​ແກ້​ໄຂ." ນາ​ຍົກ​ລັດ​ຖະ​ມົນ​ຕີ ຈະ​ປະ​ເຊີນ​ກັບ​ການ​ລົງມະ​ຕິບໍ່​ໄວ້​ວາງ​ໃຈ​ລັດ​ຖະ​ບານ​ຂອງ​ທ່ານ​ນາງໃນ​ວັນ​ພຸດມື້ນີ້ ທີ່​ຍົກ​ຂຶ້ນ​ມາ​ ໃຫ້​ລົງ​ຄະ​ແນນ​ສຽງ​ໂດຍ ທ່ານ ເຈ​ເຣ​ມີ ຄໍ​ຣ໌​ບິນ (Jeremy Corbyn) ຜູ້​ນຳ​ຂອງ​ພັກແຮງ​ງານ ທີ່​ເປັນພັກ​ຂອງ​ຝ່າຍ​ຄ້ານນັ້ນ. “ທ່ານ​ນາງບໍ່​ສາ​ມາດ​ທີ່​ຈະ​ເຊື່ອ​ຢ່າງ​ຕາຍ​ໃຈ​ໄດ້ ວ່າ ຫລັງ​ຈາກ​ສອງ​ປີ​ແຫ່ງ​ຄວາມ​ຫລົ້ມ​ແຫລວ ທ່ານ​ນາງ​ຍັງ​ຈະ​ມີ​ຄວາມ​ສາ​ມາດມີ​ການ​ເຈ​ລະ​ຈາ ​ທີ່​ເປັນ​ຜົນ​ດີແກ່ ປະ​ຊາ​ຊົນ​ໃນ​ປະ​ເທດນີ້ຕໍ່​ໄປໄດ້​ອີກ." ເຖິງ​ແມ່ນ​ວ່າ​ ຈະມີ​ການ​ປະ​ລາ​ໄຊ​ໃນ​ວັນ​ອັງ​ຄານ​ວານນີ້​ກໍ​ຕາມ, ແຕ່ທ່ານ​ນາງ ເມ ກໍຍັງມີ​ທ່າ​ທີ​ວ່າ​ ​ຈະລອດ​ພົ້ນຈາກການ​ລົງ​ຄະ​ແນນ​ສຽງບໍ່​ໄວ້​ວາງ​ໃຈໃນ​ວັນ​ພຸດມື້ນີ້. ຄວາມ​ຫວັງ​ທີ່​ສູງ​ທີ່​ສຸດ​ຂອງ​ທ່ານ​ນາງ​ກໍ​ຄື ຊັກ​ຊວນ​ໃຫ້​ ອີ​ຢູ ມີ​ການ​ຜ່ອນ​ຜັນ​ໃນ​ສັນ​ຍາ​ຫລາຍ​ກວ່ານີ້ ເພື່ອ​ເຮັດ​ໃຫ້ສະມາ​ຊິກ​ສະ​ພາ​ເພິ່ງພໍ​ໃຈ. ແຕ່​ວ່າ ອີ​ຢູ ບໍ່​ຍອມເປີດໃຫ້​ມີ​ການ​ເຈ​ລະ​ຈາ​ຂໍ້​ຕົກ​ລົງ​ຄືນ​ອີກ. ປະ​ທານ​ກຳ​ມາ​ທິ​ການ​ຂອງ​ອີ​ຢູ, ທ່ານ ຊັງ-ຄ​ລອດ ຈັງ​ເກີ (Jean-Claude Juncker) ເວົ້າ​ວ່າ ພາ​ຍ​ຫລັງທີ່ໄດ້​ມີ​ການລົງ​ຄະ​ແນນ​ສຽງ​ແລ້ວ ຄວາມ​ສ່ຽງ​ໃນ​ການຖອນ​ໂຕ​ອອກ​ແບບບໍ່​ເປັນ​ລະ​ບຽບກໍ​ຖີບ​ຕົວ​ສູງ​ຂຶ້ນ." ຢູ່​ໃນນະ​ຄອນ​ລອນດອນ, ສະ​ມາ​ຊິກສ​ະ​ພາ​ທີ່​ມີ​ຄວາມ​ເຫັນ​ຂັດ​ແຍ້ງ​ກັນ ໄດ້​ວາງ​ແຜນ​ການ​ຂອງ​ຕົນ​ໃນ​ຂັ້ນ​ຕໍ່​ໄປ. ສະ​ມາ​ຊິກສ​ະ​ພາທີ່​ສະ​ໜັບ​ສະ​ໜຸນ​ການ​ຖອນ​ໂຕ​ອອກ​ຈາກ​ອີ​ຢູ ຫລື ເບ​ຣັກ​ຊິດ (Brexit) ບາງ​ຄົນ​ຢາກ​ອອກ​ຈາກ​ອີ​ຢູ ໂດຍບໍ່​ຕ້ອງ​ມີ​ຂໍ້​ຕົກ​ລົງ​ໃດໆ​ເລີຍ. ສ່ວນ​ຄົນ​ອື່ນໆ ແມ່ນ​ພັກ​ດັນ​ໃຫ້​ມີ​ການອອກ ຈາກ​ສະ​ຫະພາບ​ດັ່ງ​ກ່າວ​ຢ່າງນີ້ມນວນກວ່າ ຫລື​ບໍ່ ​ກໍ​ໃຫ້​ມີ​ການ​ລົງ​ປະ​ຊາ​ມະ​ຕິ​ຄັ້ງ​ທີ​ສອງ. ອາ​ຈານ ເມນອນ ກ່າວ​ເພີ້ມ​ອີກວ່າ"ພວກ​ເຮົາ​ປະ​ເຊີນ​ກັບ​ຜົນຈະອອກມາຫລາຍໆແບບ. ​ຜົນທັງ​ໝົດ​ເຫລົ່ານັ້ນ ​ລ້ວນ​ແຕ່ເປັນ​ເລື້ອງ​ໜ້າ​ເຫລືອ​ເຊື່ອ​ຫລາຍ​ທີ່​ສຸດ ຊຶ່ງ​ມັນອາດ​ຈະມີ ​ຂໍ້​ຕົກ​ລົງ​ຖືກ​ຮັບ​ຮອງ​ເອົາ, ມີ​ການ​ລົງ​ປະ​ຊາ​ມະ​ຕິ​ອີກ​ເທື່ອ​ນຶ່ງ, ມີ​ການ​ເລືອກ​ຕັ້ງ​ທົ່ວ​ປະ​ເທດ, ບໍ່​ມີ​ຂໍ້​ຕົກ​ລົງ​ໃດໆທັງສິ້ນ. ອັນ​ໃດ ອັນ​ນຶ່ງໃນ​ນີ້ຈະ​ເກີດ​ຂຶ້ນ." "ອາດ​ມີ 80 ເປີ​ເຊັນ​ຂອງ​ຄົນ​ໃນ​ເກນ​ອາ​ຍຸ​ຊ່ຳໆ​ຂ້ອຍນີ້ ຢາກ​ຈະ​ຢູ່​ໃນ​ອີ​ຢູສືບ​ຕໍ່​ໄປ. ແລະ ​ແຕ່​ວ່າ​ສຽງ​ຂອງ​ພວກ​ເຂົາ​ຖືກ​ສຽງ​ຂອງ​ຄົນ​ລຸ້ນ​ແກ່​ກວ່າ ພວກ​ທີ່​ຢາກ​ອອກ​ຈາກ​ອີ​ຢູນັ້ນ ຖ້ວມໄວ້ ໃນ​ຂະ​ນະ​ທີ່​ພວກ​ເຮົາ​ຈະ​ເປັນ​ຜູ້​ດຳ​ລົງ​ຊີ​ວິດ​ຢູ່​ກັບ​ຜົນ​ຕາມ​ມາ​ຂອງ​ສະ​ພາບ​ການນີ້​ ດົນ​ກວ່າ​ໝູ່​ໝົດ." ​​ອັງ​ກິດກຳ​ລັງ​ລອຍ​ຢູ່​ໃນ​ກະ​ແສ​ນ້ຳ​ທາງ​ການ​ເມືອງ​ແບບບໍ່​ມີ​ຂອບເຂດ​ເລີຍ. ແຕ່​ວ່າ ມີ​ສິ່ງ​ດຽວ​ທີ່​ແນ່ນອນ​ຄື ຈະ​ມີ​ຫຍັງ​ເກີດ​ຂຶ້ນ​ຢູ່​ໃນ​ສະ​ພາ​ກໍ​ຕາມ ​ຢູ່​ໃນ​ຫລາຍ​ອາ​ທິດ​ຕໍ່​ໜ້ານີ້ ຢູ່​ຕາມ​ຖະ​ໜົນ​ຫົນ​ທາງ​ຄວາມ​ແຕກ​ແຍກ​ກັນໃນ​ທົ່ວ​ສັງ​ຄົມ ຈະ​ໃຊ້​ເວ​ລານາ​ນກວ່າຫລາຍ ທີ່​ຈະ​ປົວ​ແປງ​ໃຫ້ດີໄດ້. 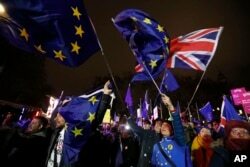 Britain's Prime Minister Theresa May faces a confidence vote Wednesday after suffering a historic defeat in parliament Tuesday when British lawmakers resoundedly rejected the deal she struck with Brussels for leaving the European Union later this year. Many in her own party voted against the deal but Prime Minister May is vowing to carry on. As Henry Ridgwell reports, Europe has warned the risks of Britain crashing out with no deal have increased. Outside parliament, rival protestors faced off into the night Tuesday. Inside, the political drama culminated in a bruising defeat. "The ayes to the right: 202. The noes to the left: 432." The biggest government defeat, by 230 votes, in recent British history. Normally that would force the prime minister's resignation, but she vowed to carry on. "The government has heard what the House has said tonight, but I ask members on all sides of the House to listen to the British people, who want this issue settled." 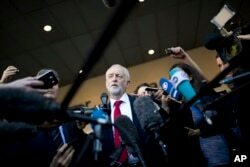 The Prime Minister will face a vote of confidence in her government Wednesday tabled by opposition Labour leader Jeremy Corbyn. "She cannot seriously believe that after two years of failure she is capable of negotiating a good deal for the people of this country." Despite Tuesday's defeat May will likely survive Wednesday's vote of no confidence. She vowed to seek consensus on the way forward. Her best hope is persuading the EU to offer more concessions on the deal to satisfy MPs. "A fig leaf if you like, to allow them to say, I had my concerns, they've been assuaged by this document from the European Union, now I can change my mind and vote with the prime minister, or at least abstain.'" But the EU has ruled out reopening the deal. EU Commission President Jean-Claude Juncker said after the vote the risk of a disorderly withdrawal has increased". In London, rival lawmakers are plotting their next move. Some pro-Brexit MPs want to leave the EU without a deal. Others are pushing for a softer exit or a second referendum. "We are confronted with a range of outcomes. They all seem enormously implausible the deal passing, having another referendum, general election, no deal. One of them will happen." Meanwhile, the protests are becoming more heated. "Eighty-odd per cent of people my age are wanting to remain in the EU. And yet their voices are being shouted over by the older generations, those of them who want to leave, when we're the ones who are going have to live longest with the consequences of this." "There's so many benefits of us leaving the European Union, and most of all we can take back control of so many powers which we've given away."